FPV displays the wrong date / time field in Canon CR2 files. I found this out when my XP PC did some strange things with times after the recent clock change at the end of October and displayed an unexpected "Modified" date/time. 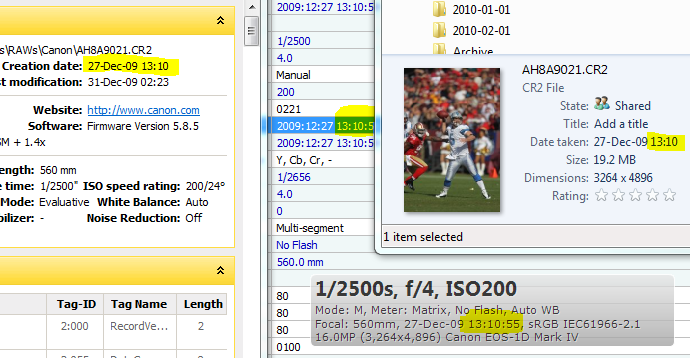 The Canon raw converter, for example, allows file/Exif information to be displayed and this shows the correct time. FPV gets its time from somewhere else and with some of my images it is wrong depending on when in the year it was taken. The program displays what's in the EXIF DateTimeOriginal field embedded in the files, without modifications. Unfortunately EXIF timestamps don't have provisions for time zones nor daylight saving time and what's written in there by the camera is anyone's guess (it could be local time or UTC, and it depends of the current date/time and time offset currently set in the camera). It is possible that more information gets written in proprietary fields (known as MakerNote) and that Canon own software knows more about the date/time taken than what is written in the standard EXIF field. I have some problems with the time to. I use FPV 1.4.1 on Windows XP and for all the files the time is displayed with 1h more. I use a Nikon D80 and on the JPG and DNG genedated from the NEF files thie time is displayed with +1h. The time in the FPV is 3:34:38. In Lightroom is 2:34:40. In my opinion should be 4:34:40. Because I set the time zone to GMT+2. For the NEF file the time is corect, like the one form Lightroom, but when I look in the XML file generated by Lightroom I see that even Lightroom do not calculate the Time Zone GMT+2 . FPV and Lightroom show 17:16:22. I have no idea about what you are talking about. Again, FPV displays what it finds in the file, no more, no less. Below is a screenshot showing ExifTool, PhotoME, Windows Explorer and FastPictureViewer all displaying EXACTLY the same time from a Canon CR2 file (EOS MkIV), on Windows 7. Again, the EXIF time does *NOT* have provisions for time zones or DST. The time in the files is a 19 char string in the following format "YYYY:MM:DD HH:MM:SS" as per the EXIF 2.2 specs - No time zone, no DST. If you get the wrong time check your camera settings.